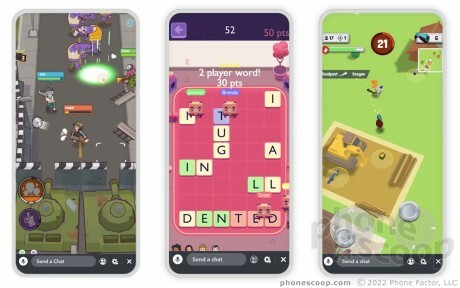 Snap has added Snap Games to the Snapchat app, a curated set of multiplayer games that Snapchat friends can play together, right within the app. The games are free to play, but include six-second ads. They're all designed for a vertical screen orientation. Players can chat via text or voice while playing. The first six titles include Tiny Royale by Zynga, Alphabear Hustle by Spry Fox, C.A.T.S. Drift Race by ZeptoLab, and Snapchat's own Bitmoji Party, where you play using your own avatar. Snapchat today rolled out Snappables, which it says are new Lenses meant for playing augmented reality games with other Snapchat users. Snappables are controlled via touch, movement, and facial expressions. Snapchat today introduced a new feature called Snap Map Explore. The idea is to make it easier for people to see where friends are, such as landmarks, festivals, or parks, or see what else is going on nearby. Snapchat today improved its Android and iOS mobile apps with new tools. First, the app can now record up to six 10-second clips over the course of one minute.